Want to add the whimsical and enchanting to your outdoor spaces? 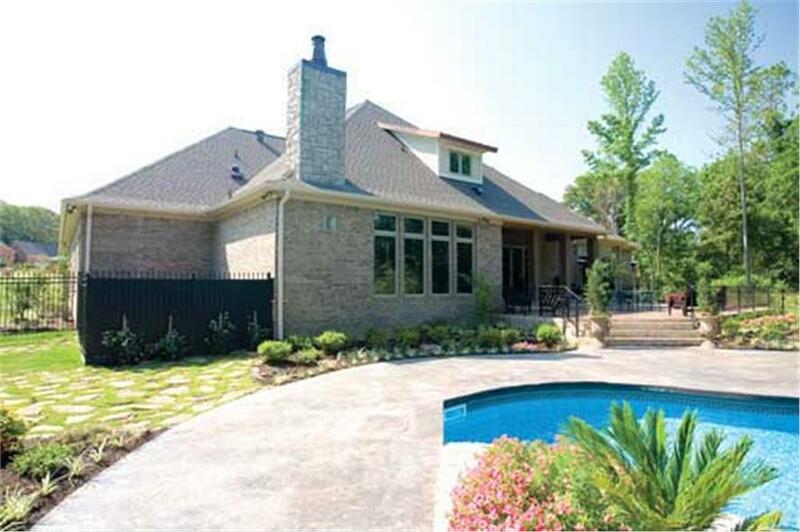 Take a look at the driveway, garden paths, fences, patios, and all the hard landscaping around your home. Think of all the possibilities for creating artistic and imaginative soft and permeable landscapes in the entryways, garden retreats, and shaded patios. Do you want trees, flowers, container gardens, shrubs, and native plants around the home? What about pebbles and stepping-stones in the Zen garden? Mulch, gravel, or oyster shells? Whatever you decide to do, have fun as you bring your outdoor spaces to life with attractive and eco-friendly soft and permeable landscaping designs. Here are seven options to get you thinking about the finishing touches to your landscape. 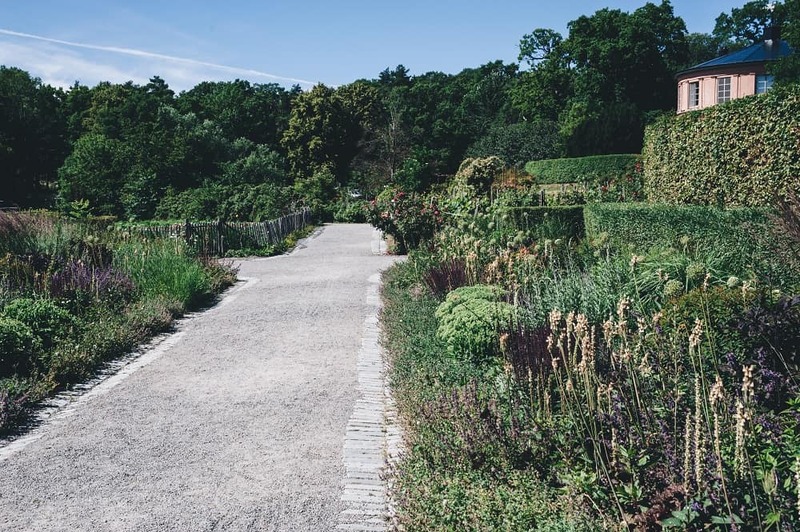 One of the most versatile and flexible permeable landscape materials, gravel covers driveways, soft garden paths, courtyard entries, and secluded patios. Pea gravel, the most common form, is made of small crushed rock fragments and is ideal for high-traffic outdoor areas. It is affordable, durable, stands up well to rainy weather, comes in several colors, and can be refreshed every few years. Disadvantages: Gravel can get dusty and messy over time. You’ll need a pathway border to keep it in place. 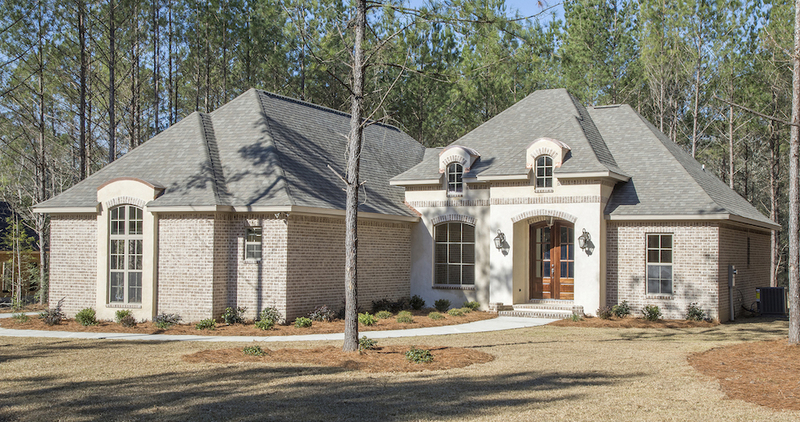 A gravel entry lends the perfect country atmosphere for a 1-story, 4-bedroom Acadian-style home plan (House Plan #142-1152). Like pea gravel, decomposed granite is inexpensive, permeable, allows good drainage, and is soft on the feet. It is described as “finer and generally more stable than gravel” and formed from the natural weathering and erosion of solid granite. Loose decomposed granite is considered the least expensive and is excellent for pathways, play areas, and patios – and for mulching garden beds because of its nutrients. It comes in a variety of colors, including brown, tan, red, gray, black, and green. Disadvantages: Loose granite erodes easily, and in areas with heavy rainfall, it can become muddy and dirty. Because it sticks to the bottom of shoes, especially when wet, you run the risk of scraping floors – if you forget to take your shoes off before going into the house. An idyllic site and sight! 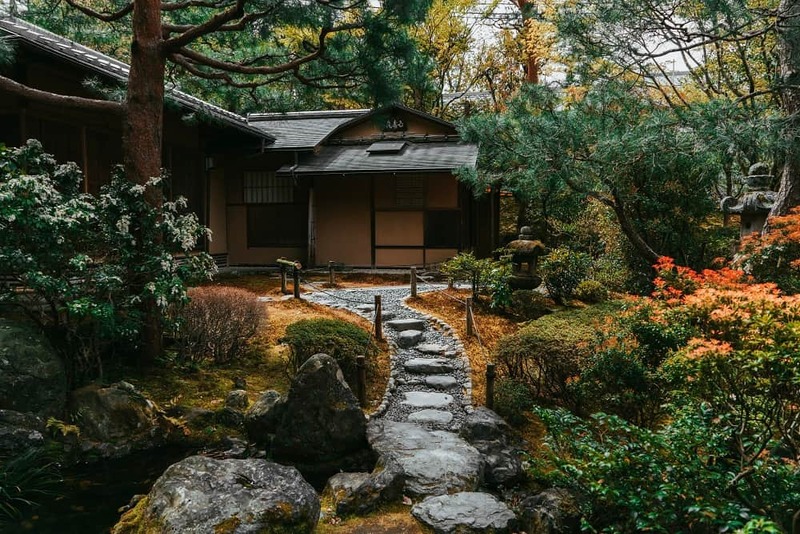 Walk barefoot and on the decomposed granite covering a small patio; enjoy the quiet and the landscape of colorful flowers, plants, and decorative rocks. Any gardener will tell you that adding mulch to the landscape is another way to beautify outdoor space. Mulch not only gives flowers and plants a nice, clean look but also protects them. Mulch also suppresses weeds, helps reduce soil erosion, and conserves water. Organic mulch may be shredded tree bark, wood chips, grass and lawn clippings (even debris), straw, and chopped leaves. When these materials decompose, they add nutrients to the soil. While organic mulches decompose during the planting/growing season, the inorganic ones do not degrade as fast. But whatever kind of mulch you decide to use, you’ll make your landscape attractive and eco-friendly – and your plants healthy. Disadvantages: Some mulch is prone to mold and fungal growth in moist environments, and it may need to be replenished or replaced often. 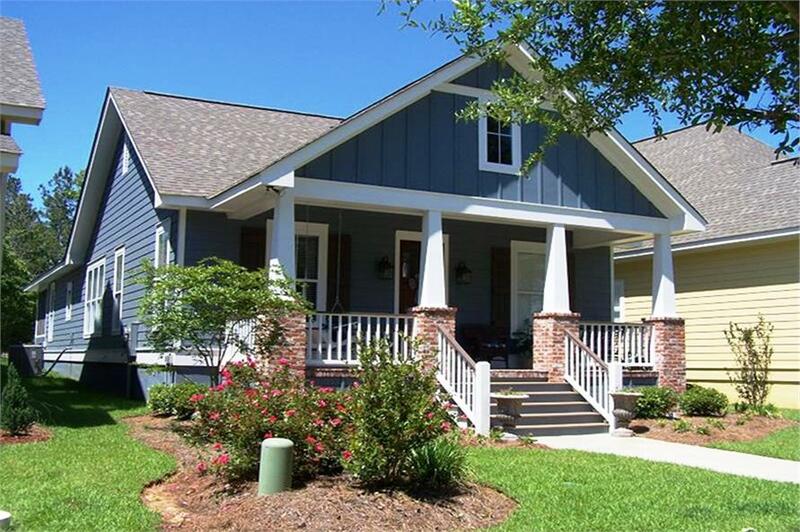 There’s a lot to love about this 2-story, 4-bedroom Country style home plan: the four columns anchor it, and the well-manicured front lawn enhances its curb appeal. Note the colored mulch around the trees and plants, which adds to the home's charm (House Plan #146-1495). Take a page from this 1-story, 3-bedroom Cottage style home plan, which has a small garden featuring mulch around the shrubs, flowers, and other plantings that breaks up the grass on the front lawn (House Plan #142-1079). If you want a change from the monotony of gravel or concrete garden paths, think of stepping-stones for an attractive and different look. They are inexpensive and easy to install, especially for homeowners who love “do-it-yourself” projects. Stepping-stones are a practical way to handle foot traffic on the lawn and other landscaped areas. Disadvantages: Stone can get hot in the sun and slippery when it rains – or when it gets wet. Watch out for moss and algae that may grow on the stones because they can add to slippery conditions. You can get to this home's entry from the driveway, but another way to the front door is through this stepping-stone path. Navigate the stepping-stones (left in photo) to get to the rear patio of this 2-story, 3-bedroom Contemporary style home plan with European influences. 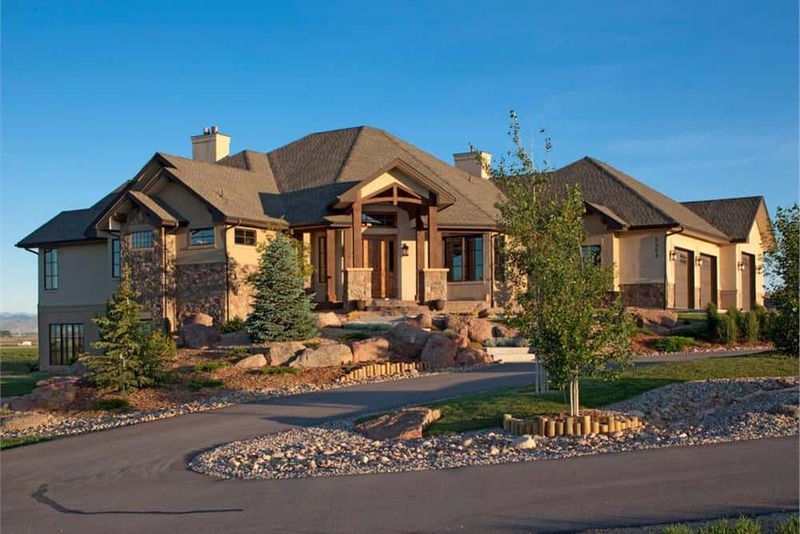 The seemingly random placement of the stones creates a distinctive landscape design (House Plan #153-1897). Replace mulch with rocks for pathways and backyards. While they are more expensive, rocks are durable and low-maintenance. They come in different sizes, shapes, and color; and they add variety to the landscape design. Choices include beach pebbles, river rocks, black lava rocks, terra-cotta stones, or white marble chips. Disadvantages: Rocks can be expensive – and depending on the kind, may be difficult to get. River rocks present a weeding challenge. Water cascades down the large rocks of the front fountain of a gorgeous 2-story, 4-bedroom Craftsman style home plan. The fountain is surrounded by a border of differently-shaped and colored rocks (House Plan #161-1017). It may come as a surprise to most people that oyster shells originated as paving material in Colonial times. Instead of throwing away shells after they consumed oysters, the early settlers recycled them and used them to cover roadways and paths. 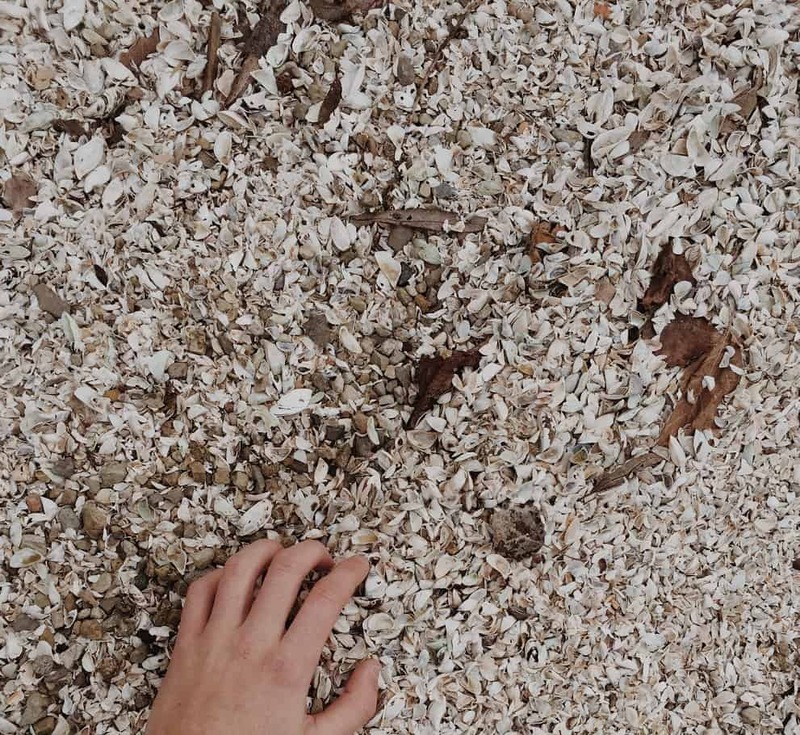 Today, oyster shells are an alternative to decorative mulches and gravel for driveways, courtyards, and patios. They are an eye-catching option, soft on the feet, and provide plants with needed nutrients. Disadvantages: Homeowners may have to deal with the short-lived nuisance of the unpleasant odor emanating from the shells before they decompose. The shells may also have to be replenished periodically. A garden path covered with oyster shells stands out amid the flowers, trees, shrubs, and plants. Want some tranquility, beauty, and style in your landscape design? How about planting succulents and native plants? Succulents are a variety of plants – some with flowers – that store water in their leaves. From cactus to jade plant, aloe vera, and burro’s tail, succulents thrive in dry climates, are easy to grow, and are drought-tolerant. They come in many interesting shapes, textures, and appealing colors – green, pink, red, white yellow, blue, and more. 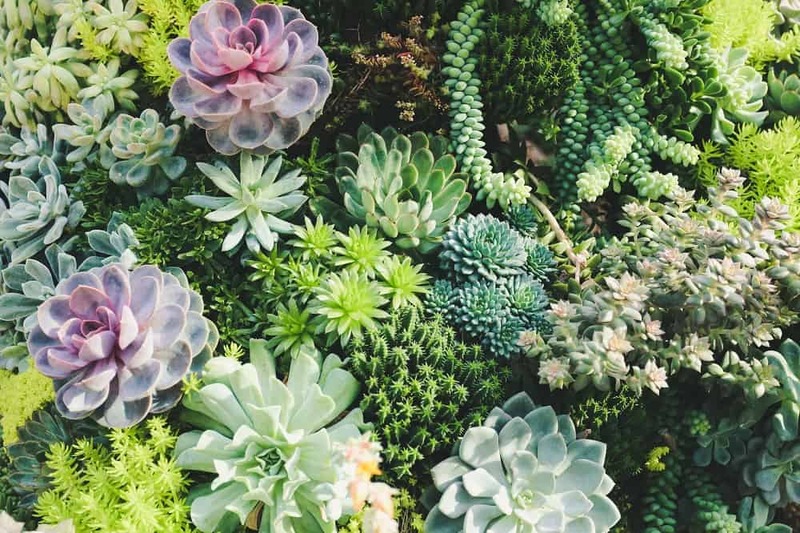 Disadvantages: The biggest problem with succulents is rot – which comes from overwatering them during the growing season. A number of varieties – like cacti – have prickly spines that homeowners and guests have to be careful about. A close view of the succulent garden highlights the amazing colors, shapes, and textures of the plants. Let the artist in you take over! After all, your landscape is like a canvas … you can try new colors, plants, flowers, shells, and stones – and come up with a vibrant and imaginative design. Share your own experiences in the comments section below! 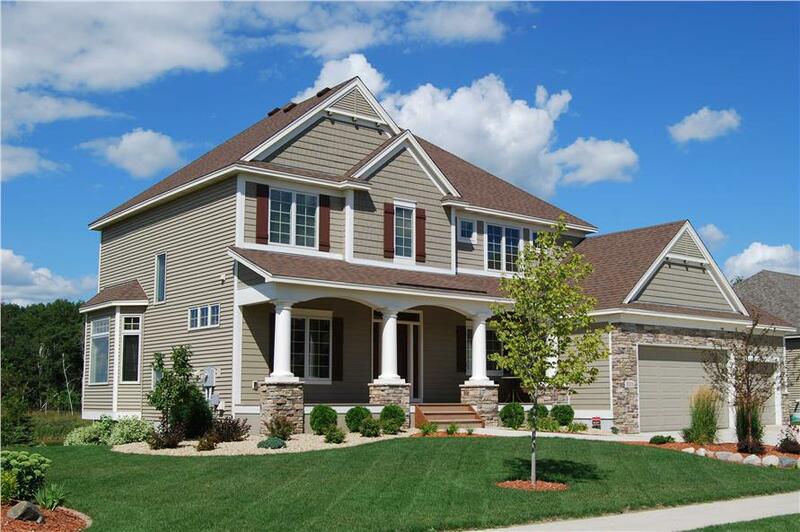 Footnote: The top photograph in the lead image of this article is a 1-story, 4-bedroom, 4-bath European-style home plan with a fabulously landscaped couryard entry complete with trees, shrubs, plants, and colorful flowers. 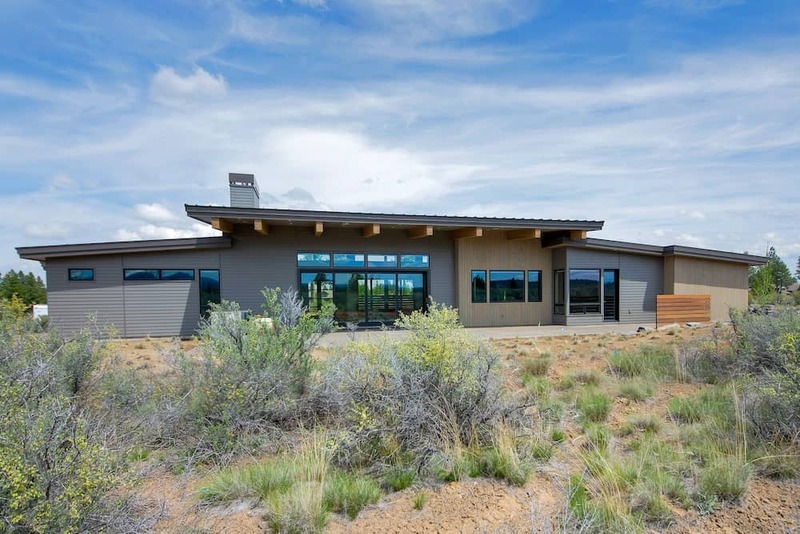 For more details, click here (House Plan #153-1095).